Across central and northern Illinois, there was rainwater everywhere Saturday: covering expressways, filling viaducts and even seeping into the tunnels of the Cook County Jail. Severe storms dumped more than seven inches of rain across the region overnight and left up to 150,000 people without electricity, officials said. By Sunday, much of that water had receded, but flood warnings were still in effect, and many residents were still cleaning up. NBC 5 viewer provides this video of his street and his basement in Westchester. Chicago Mayor Richard Daley urged residents to call for help if they need it. "Our goal is to get the city back to normal as quickly as possible," Daley said at a news conference Saturday. Torrential rains made it a nightmare for drivers trying to get around, forcing the closure of parts of several major highways. High standing water on the Eisenhower Expressway forced police to completely shut it down at Manheim Road, and parts of the Dan Ryan and Kennedy expressways were also closed due to flooding. All were re-opened by Saturday night. Water also closed parts of the Blue, Pink and Orange CTA lines, leading crews to call in bus shuttles. Those lines were all back working by Saturday night. Chicago fire officials said they received 100 requests to pull people out of flooded viaducts Saturday morning, and officials begged drivers not to wade into waterlogged roadways. Officials also received more than 1,300 reports of residents with water in their basements. 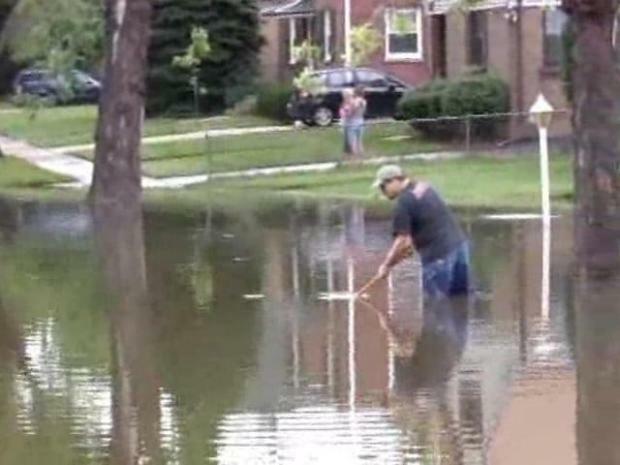 The Chicago Park District closed all of the city's beaches, at least through Monday, after flooding forced sewer water to be released into Lake Michigan. The Metropolitan Water Reclamation District opened gates into the lake after officials say the heavy rains inundated the sewer system. That didn't hamper more than 350 sailors from braving the annual yacht race from Chicago to Mackinac Island. Race officials say the 333-mile race up Lake Michigan goes on rain or shine. Water even made its way into Cook County Jail's tunnels, where inmates are typically transported. Steve Patterson, spokesman for the Cook County sheriff's department, said several areas of the jail were under water and unusable. The flooding, coupled with temporary outages in Cook County Criminal Courthouse, forced all bond hearings Saturday to be held elsewhere. A 12-foot deep sink hole was also reported at South Cottage Grove Avenue and East 73rd. Crews put up barriers around the 10-foot square hole and began work to fix it, according to Chicago Breaking News. Chicago's western suburbs were particularly hard-hit, and Westchester and Cicero have been declared disaster areas by officials. In Westchester, crews set out in boats to rescue people trapped in their flooded homes or in cars in viaducts. Naperville was making sandbags available to residents in case the DuPage River jumped its banks, said City Engineer Bill Novack. Bands of storms knocked out power to thousands of customers in northern and central Illinois, according to Ameren and ComEd. Some 13,600 ComEd customers still had no power as of 9 p.m. Saturday, about 4,500 of them in Chicago. High winds caused extensive damage by downing power lines and poles in parts of Henry, Bureau and La Salle counties, according to Ameren. The utilities were hoping to get customers' lights back on by Sunday.